We’ve previously featured Monica Menez’s work but today we showcase her short fashion film Hors d’oeuvre which was hugely successful on the fashion film festival circuit playing at New York, Madrid, and won Best Art Direction at the fifth A Shaded View on Fashion Film Festival. 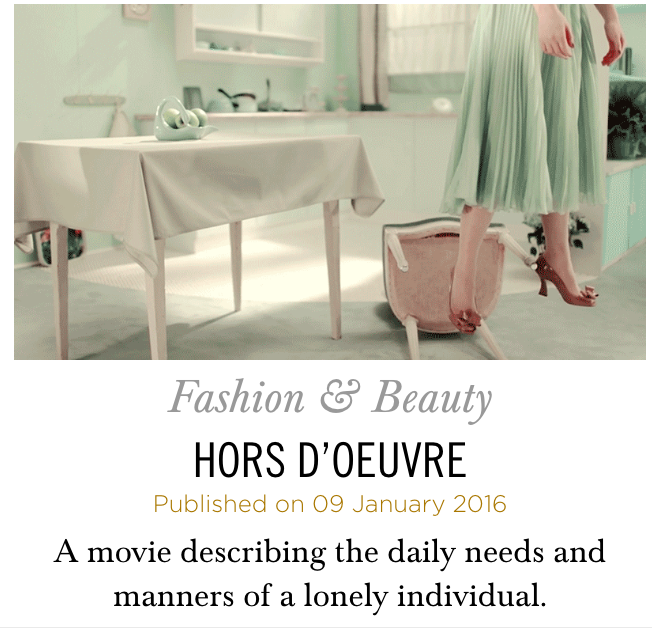 The short, divided into three episodes, describes the daily needs and manners of a lonely individual where Menez’s quirky and unique visual style of filmmaking shines. What was the initial inspiration for Hors d’oeuvre and how did you develop the idea? While I was still working on Precious I discovered a funny piece of music, an old Mexican sounding Tango. When I listened to it, I initially had the vision of legs moving to the rhythm of the music, and that it would be best if this person would be hanging from the ceiling. The scenery was inspired by a look that Armstrong, a huge American carpet manufacturer, used in his ad photos in the 1950s and 60s. These pictures showed spacey furnished apartments with extreme and futuristic colourings. Why did you decide to format the film into three separate “episodes”? The idea came up while I was working on the first episode. A surprising, unexpected ending is a crucial part of my films, and when I had finalised the story of the first episode, I decided to develop two other ideas that take place in the same setting. How do you approach the visual aesthetic for your films and does it differ from your photographic work? Every film starts with fixing the colour scheme and the corresponding scenery. Put simply, my first thoughts are not on the characters, but on the setting. I usually pick three to five colours that appeal to me and that should be an integral part of the film. Based on these colours I start to work out the mood that the film should have. After I have fixed these components, I prepare everything else, from the setting to the clothes. The prearrangements for a film are much more detailed and complex than the ones I have to make for my photographic work. Do you have any advice for filmmakers or photographers who are about to embark on shooting their first fashion film? It is important to find your own and unique style. Use a good story and a visually exciting concept which may be abstract, and you are on the right track! What elements are needed to create a good fashion film? It´s like baking a cake: You need various ingredients that have to be perfectly harmonised. So, the recipe for a good fashion film is: interesting music, a well composed setting, great fashion, some extraordinary ideas and at least one strong actress/actor. For more information on Monica Menez and her projects visit here.